Bridgewater Township is a township in Somerset County. As of the 2010 United States Census, the township's population was 44,464. The thirty-three square mile area which is now the Township of Bridgewater was originally purchased from a local Indian tribe. Chartered by King George II of England in 1749, and incorporated in 1899, Bridgewater is a modern suburban municipality with a balance of residential and commercial uses. In the early years, Bridgewater was known as a farming town. What is now Somerville and Raritan were once part of Bridgewater Township until they broke away years after the chartering. Today, as was said, Bridgewater is a diverse and thriving township with a mix of both rural and suburban life. Township is prime ground for many new and large businesses. Check out Bridgewater's market statistics HERE! Bridgewater is the home of the upscale Bridgewater Commons Mall which includes Bloomingdale's, Macy's, Lord & Taylor and 160 specialty stores including a movie theater. The Village at Bridgewater Commons is an outdoor lifestyle center adjacent to the mall boasting Starbucks, Crate & Barrel, Maggiano's Little Italy, Chipotle Mexican Grill, Banana Republic, LOFT, Brooks Brothers and nine other upscale retailers. On the outskirts of the mall along Commons Drive are BestBuy and TJ Maxx-Home Goods. 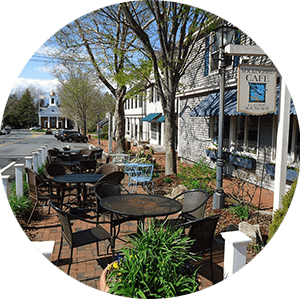 Chimney Rock Inn is the top family restaurant in central New Jersey located in Bridgewater. Meals are served at a great price, a cozy atmosphere. The menu consists of casual Italian and American cuisine, with legendary thin crust pizza, crispy salads, and slow smoked ribs. Other restaurants include, Houlihans, Milano Grill, McCormick & Schmick's Seafood & Steaks Restaurant, Olive Garden, Thai Kitchen, or vist nearby Somerville and enjoy a truly unique dining experience created by the art of fondue along with many other restaurants. Located in Bridgewater Township, Duke Island Park is a site of rich beauty offering varied recreational experiences. Truly an "island" park, it is traversed by the historic Raritan Power Canal. The Somerset County Park Commission acquired this 340.5 acre site in 1958, and has developed it to provide a wide variety of active and passive recreational opportunities and special events for park visitors. Duke Island Park also offers bike trails for Somerset County biking enthusiasts, as well as softball fields and ice skating in the winter. Activities include biking, softball, walking/jogging trail, fishing, hiking trail, ice skating, cross-country skiing, bird watching, picnicking, and playgrounds. Green Knoll Tennis Center features summer instructional clinics for players of all abilities, as well as a variety of youth and adult tournaments. Lessons include drill work, play action drills, challenge court time, and tournaments. Green Knoll Golf Course, an 18 hole public golf course known for its tight fairways and rolling contours, also has a 9 hole par three Pitch and Putt Course, golf shop and snack bar. Bridgewater is a relatively large, mostly affluent suburban township located in the center of Somerset County. 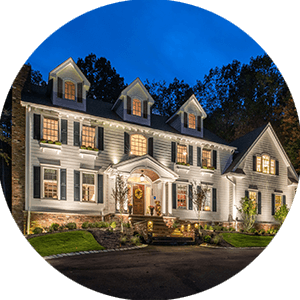 Although Bridgewater Township is home to a significant industrial sector, its appeal lies within six hamlets, each offering distinctive features such as beautiful countryside, quiet neighborhoods, sophisticated retail district, and modern office buildings. Bridgewater encompasses the small communities of Martinsvville, Finderne, Bradley Gardens, Green Knoll, Somerville Manor, and Sunset Lake. The best of small-town living within easy access to major transportation routes makes the township a popular choice. Bridgewater is part of the Bridgewater-Raritan Regional School District, which serves students in pre-Kindergarten through 12th grade from Bridgewater and Raritan Borough. In the past, Bridgewater-Raritan High School was recognized with the Blue Ribbon School Award of Excellence by the United States Department of Education, the highest award an American school can receive from the federal government and was also named a "Star School" by the New Jersey Department of Education, the highest honor that a New Jersey school can achieve. Bridgewater-Raritan High School is one of only three high schools in the state of New Jersey to have received both awards. Bridgewater is also the home of the Somerset County Vocational and Technical High School, a four-year magnet school that provides occupational and academic training to students from all of Somerset County. 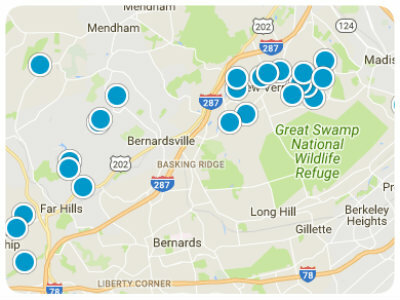 Somerset Medical Center located in Somerville, NJ is just a few miles away. Bridgewater is crisscrossed by several major highways, including Interstate 287, Interstate 78, U.S. 22, Route 202-206 and Route 28. The Raritan Valley Line of NJ Transit also passes through Bridgewater. There are two stations in the Finderne area, the now-closed Finderne off Finderne Avenue and the Bridgewater station on the old American Cyanamid property. NJ Transit bus service is provided on the 114 route to the Port Authority Bus Terminal in Midtown Manhattan, to Newark on the 65 line (Limited) and local Wheels service on the 884 and 989 bus routes. 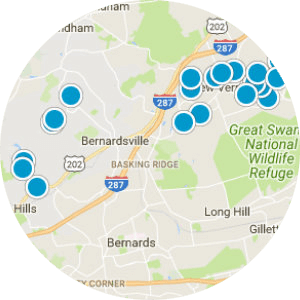 Bridgewater Township is serviced by three local airports, Solberg-Hunterdon Airport to the west in Readington, Somerset Airport to the north in Bedminster Township, and Central Jersey Regional Airport to the south in Manville. These airports are open to the public and offer charter flight services as well as flight training and other aviation related services. They operate in all weather conditions and have instrument approaches available for use by pilots in bad weather. Scheduled commercial passenger service is provided by Morristown Airport, located approximately 17 miles away in Morristown. Newark Liberty International Airport is 32 miles away. Exceptional Location! Well maintained Ashley Model. Finished Basement.